Local food is fresher and tastes better. North Carolina farmers offer produce varieties bred for taste and freshness. Getting to know the farmers who grow your food in the Raleigh area builds relationships based on understanding and trust - the foundation of strong communities. In fact, you'll have just that opportunity at Porter Farms. When you visit our retail roadside stand or pick strawberries in our fields, it is very likely you'll meet owner and farmer Ashley Porter. We look forward to your visit. Visit Porter Farms on Facebook for the most up-to-date info. 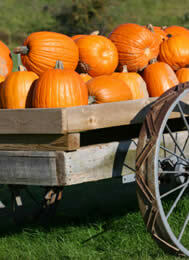 Porter Farms & Nursery operates seasonally from mid April to Halloween. See our crop calendar for our in-season foods guide. Look for the Big Strawberry. It is easy to spot the Porter Farms and Nursery produce stand on NC Hwy 42. 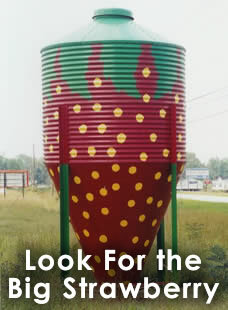 Just tell the kids to keep an eye out for our large grain bin out front - painted to resemble a strawberry! Travel I-40 East to NC Highway 42 Exit 312 toward Clayton/Fuquay-Varina. Turn Right on NC 42. Follow NC 42 West for 6.4 miles. Porter Farms & Nursery will be on the left. Travel NC 55 South toward Fuquay-Varina. Turn left onto NC 42/NC 55/US-401/N. Main and travel 1.9 miles. Turn right onto NC 42/NC 55 for 0.1 mile. Turn left onto NC 42 for 5 miles. Porter Farms & Nursery will be at 3504 NC Highway 42 on the right. Travel Old Stage Road South to NC 42. Turn left on NC 42 for 1.5 miles. Porter Farms & Nursery will be on the right. Satellite Strawberry Farm Just 10 minutes south of Downtown Raleigh. Open with a full variety of seasonal produce through early August. This Market location is all about strawberries. Bring your family to pick from over 5 acres of meticulously kept berries from early April through late May. No time to pick – no worries! Our pickers are trained to fill our buckets with only the reddest sweetest berries for a bucket of goodness all the way through! Our Raleigh Strawberry Stand operates seasonally and is located in the McCullers Crossroads Community. It is at the corner of 10-10 and Lake Wheeler Road, convenient for 401 and to residents of Raleigh and Apex, NC.